Seasonal and Extended Range Prediction group of IITM has been providing experimental real-time forecast of the active-break spells of Indian Summer Monsoon Rainfall since 2011 up to 4 pentad lead using an indigenously developed Ensemble Prediction system (EPS) based on the state-of-the-art Climate Forecast System Model Version 2 (CFSv2). The EPS will generate a large number of forecasts from different initial conditions so that the expected forecast and also the expected spreads or uncertainties in terms of probability from this forecast can be informed. Comparison is shown between CFSv2 skill and the atmosphere only GFSv2 model forced with bias corrected SST forecasted from CFSv2. Forecast is generated after every 5 day since 16 May. The pentad prediction skill may be considered as the intraseasonal variability prediction skill and is a more rigorous way of evaluating the model's hindcast skill. 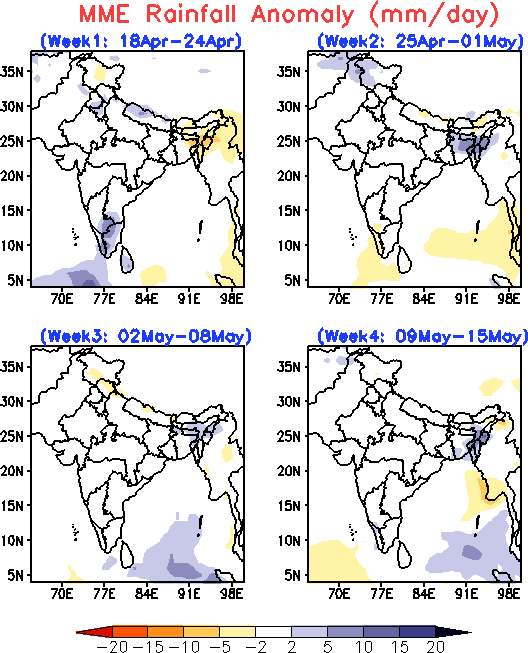 In addition to this, some aspects of large-scale Monsoon Intraseasonal Oscillations are also presented here. Predictions and verification have been done over 4 different homogeneous regions of India where ISMR is more or less homogeneous. The selected regions are Central India (CEI), North-East India (NEI), North-West India (NWI), South peninsula (SPI) and a broader region, monsoon core zone of India (MZI).